Springtime finds me on a wonderful trail bike ride at a large state park north of Gainesville. 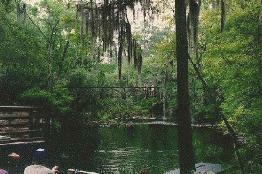 O'Leno State Park, consisting of 2,000 acres, contains a natural bridge and sinkholes of the Santa Fe River. It also features a deep hardwood forest. The Park borders the Santa Fe River, which enters the Suwannee River. The Park has several miles of beautiful and scenic trails which took us about five hours to ride. We stop for lunch at the very unique "River Rise," which is a location where the river actually goes underground for three miles before emerging again to run as a river at another point in the Park. In the past, I have canoed to the River Rise with a friend. We see a huge number of turtles on a rather pleasant trip. Another unique sight on that day is seeing a "baby" sinkhole. I say "baby" because the sinkhole had just opened up only seven months prior to our visit. It is fascinating to see all the trees at various stages of falling into the sinkhole lake. In addition, within the park is a suspension bridge spanning the river (see photo), built by the Civilian Conservation Corps in the late 1930s. Nice views of the river can be had from the bridge. I also have gone to the Park each of the past several years for "Vernal's All-Night Equinox Dance," which features old-tyme fiddle music, and famous callers calling squares, circles, and contras. On the Saturday when we dance all night, a "pie social" is held in which the dancers chow down on the many pies and cakes brought by the dancers to the Dance. It is so much fun that I have often been on the verge of "dancing till I drop." The highlight, for me, was in 1995, when a pagan ritual was held during the dance weekend, at which pagan "priests" performed a pagan sermon.